A good party or gala will only be improved with creative event theming, as this gives guests something to work their outfits around and helps planners decide on music, decor and catering for the big event. One of the best ways to tie in your decorations with the theme is by linking your lighting. Event lighting can really make or break a big bash, so take a look at these creative event theming ideas with lighting that sets your party apart with the flick of a switch. Green Lantern, Spiderman, Batman… Whichever icon takes your fancy, you’re bound to see a fair few of them when you have a superhero-themed party. If you have a multi-room venue, consider theming each room to a different comic or character. For example, a Spiderman themed room could incorporate dark corners with a red colour wash lighting up the centre of the room, with blue fairy lights completing the colour scheme. A Green Lantern room would look great with a fog or smoke machine creating a misty effect, with vibrant green uplighting reflecting the theme. Similarly, a Batman room could be completely blacked out, illuminated only by a strobe light in time to ominous music projected through an audio system. An Old Hollywood theme is a classic that will never go out of style. Stick to a colour palette of cream, gold and silver and add plenty of sparkle for a real glitz and glam effect. The star of the show should be a chandelier hanging above a spiral staircase – or in the middle of the ballroom if you don’t have the luxury of stairs. You could even use several of these stunning pieces throughout your venue, including in the dining room. In the warmer months, everyone loves a cocktail in the sunshine. So, theming your event with beach balls, palm trees and bright colours is a winning combination. Using strategically positioned LED spotlights that change colours to light up the night and move with the music can really amp up the party mood. Downlights and uplights can be used to highlight the central installation and table decorations. While using a Geyser coloured smoke machine will create amazing smoke pillars that wow the crowd without emitting harmful Carbon Dioxide fume. 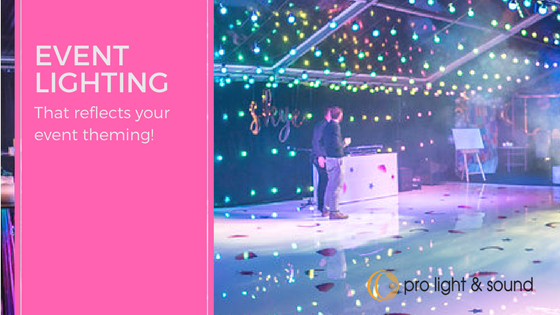 If you’re planning your next party or gala event, talk to a Pro Light & Sound expert to help you link your event lighting to your event theming.